My favorite location at the moment is the front door of our house, where we have a Carolina Wren in residence. Since it constructed its nest in the wreath, my wife and I have been relegated to using the back door for coming and going. Very nice wreath to begin with, and this makes it perfect! I hope she keeps the cowbirds out. Should be some excellent photographic opportunities for you. Thanks Jeff. Fortunately, I haven't seen any cowbirds close to where I live. I'm looking forward to when they start feeding the young. Nice to see such an obvious sign of spring. 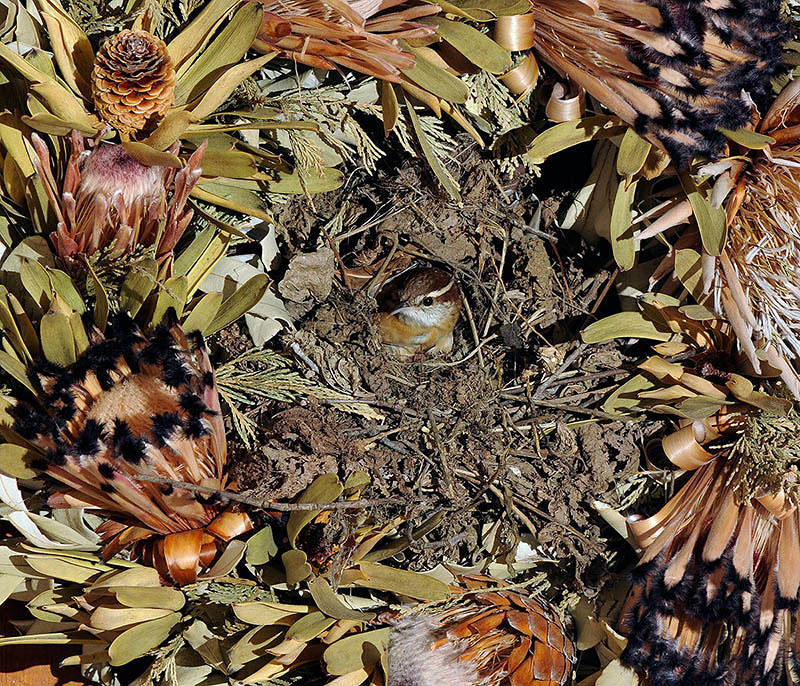 We get wrens to our feeders in Wash, DC, but have never seen a nest. <grin> I have relatives who have the same kind of problem. For several years they were getting something trying to build sloppy muddy nests in their front door wreaths. They just took to keepng the wreaths down until the bird nesting season was over.